The comedy follows a sheltered young woman (Hough) who loses her faith after a plane crash and decides to go to Las Vegas to experience the wild side of life. On her journey, she meets unlikely companions (Brand and Spencer) who inadvertently help her find her true self. 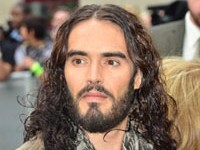 Russell Brand Targets Cupid at Warner Bros.